In pursuance of the provisions of the Local Government Act, 1993 and the Regulations thereunder, notice is hereby given that an ORDINARY MEETING of Penrith City Council is to be held in the Council Chambers, Civic Centre, 601 High Street, Penrith on Monday 6 April 2009 at 7:30PM. Ordinary Meeting - 23 March 2009. Policy Review Committee Meeting - 30 March 2009. Council values the unique status of Aboriginal people as the original owners and custodians of lands and waters, including the land and waters of Penrith City. Council values the unique status of Torres Strait Islander people as the original owners and custodians of the Torres Strait Islands and surrounding waters. We work together for a united Australia and City that respects this land of ours, that values the diversity of Aboriginal and Torres Strait Islander cultural heritage, and provides justice and equity for all. “Sovereign God, tonight as we gather together as a Council we affirm that you are the giver and sustainer of life. We come together as representatives of our community to make decisions that will benefit this city and the people within it. We come not in a spirit of competition, not as adversaries, but as colleagues. Help us to treat each other with respect, with dignity, with interest and with honesty. Help us not just to hear the words we say, but also to hear each others hearts. We seek to be wise in all that we say and do. As we meet, our concern is for this city. Grant us wisdom, courage and strength. - Council’s Ordinary Meetings are held on a three-week cycle where practicable. - Policy Review Meetings are held on a three-week cycle where practicable. - Members of the public are invited to observe meetings of the Council (Ordinary and Policy Review Committee). Should you wish to address Council, please contact the Public Officer, Glenn McCarthy on 4732 7649. His Worship the Mayor, Councillor Jim Aitken OAM read a statement of recognition of Penrith City’s Aboriginal and Torres Strait Islander Cultural Heritage. The Council Prayer was read by Rev. Neil Checkley. His Worship the Mayor Councillor Jim Aitken OAM, Councillors Kaylene Allison, Robert Ardill, Kevin Crameri OAM, Greg Davies, Mark Davies, Tanya Davies, Ross Fowler OAM, Ben Goldfinch, Jackie Greenow, Prue Guillaume, Marko Malkoc, Karen McKeown, Kath Presdee and John Thain. 51 RESOLVED on the MOTION of Councillor Greg Davies seconded Councillor Mark Davies that the minutes of the Ordinary Meeting of 23 February 2009 be confirmed. 52 RESOLVED on the MOTION of Councillor Greg Davies seconded Councillor Tanya Davies that the minutes of the Extraordinary Council Meeting of 2 March 2009 be confirmed. His Worship the Mayor, Councillor Jim Aitken OAM declared a Pecuniary Interest in the Report and Recommendations of the Policy Review Committee Meeting held on 9 March 2009 - Item 2 – Caddens draft Local Environmental Plan and draft Development Control Plan as he owns property in the area. His Worship the Mayor, Councillor Jim Aitken OAM declared his intention to leave the meeting during debate and voting on this matter. Councillor Ross Fowler OAM declared a Pecuniary Interest in Item 6 – Riverlink Precinct Planning – Baseline Studies as he is a Director of a company that owns property in the Plan area and also the accountant for property owners within the Plan area. Councillor Ross Fowler OAM declared his intention to leave the meeting during debate and voting on this matter. Councillor Kevin Crameri OAM declared a Non Pecuniary Conflict of Interest – Less than Significant in the Report and Recommendations of the Policy Review Committee Meeting held on 9 March 2009 Item 1 – St Marys Release Area – Public Exhibition of draft Western and Central Precinct Plan as his home is located nearby to the subject area. Councillor Kath Presdee declared a Non Pecuniary Conflict of Interest – Less than Significant in the Report and Recommendations of the Policy Review Committee Meeting held on 9 March 2009 Item 1 – St Marys Release Area – Public Exhibition of draft Western and Central Precinct Plans as she owns property in a suburb which is adjacent to the subject area. Councillor Kevin Crameri OAM declared a Non-Pecuniary Conflict of Interest – Less than Significant in an item to be raised in Confidential Business as the matter indirectly concerns an individual who voluntarily handed out election material for Councillor Kevin Crameri OAM. 53 RESOLVED on the MOTION of Councillor Jim Aitken OAM seconded Councillor Greg Davies that the Mayoral Minute on Cr Karen McKeown Elected as ALGWA President, NSW Branch be received. 54 RESOLVED on the MOTION of Councillor Jim Aitken OAM seconded Councillor Greg Davies that the Mayoral Minute on Ulysses AGM a successful showcase of Penrith Valley be received. Having previously declared a Pecuniary Interest in the Report and Recommendations of the Policy Review Committee – Item 2 Caddens draft Local Environmental Plan and draft Development Control Plan, the Mayor, Councillor Jim Aitken OAM left the meeting, the time being 8.03 pm. Councillor Ross Fowler OAM then took the Chair for the consideration of the Reports and Recommendations of Committees, the time being 8.03 pm. 55 RESOLVED on the MOTION of Councillor Jackie Greenow seconded Councillor Prue Guillaume that the recommendations contained in the Report and Recommendations of the Access Committee meeting held on 4 February, 2009 be adopted. 56 RESOLVED on the MOTION of Councillor Greg Davies seconded Councillor Jackie Greenow that the recommendations contained in the Report and Recommendations of the Local Traffic Committee meeting held on 2 March, 2009 be adopted. Councillor Greg Davies requested that all East Ward Councillors be provided with a memorandum advising whether line marking at the Carinya Avenue Car park at St Marys will be carried out and also providing an update on whether the Council are going to undertake the rest of the upgrade to the car park. Councillor Kath Presdee declared a Non Pecuniary Conflict of Interest – Less than Significant in Item 1 – St Marys Release Area – Public Exhibition of draft Western and Central Precinct Plans as she owns property in a suburb which is adjacent to the subject area. An AMENDMENT was MOVED by Councillor Kevin Crameri OAM that Item 1 St Marys Release Area – Public Exhibition of draft Western and Central Precinct Plans be deferred. The Chair, Councillor Ross Fowler OAM noted that the AMENDMENT LAPSED for a want of a seconder. Councillor Kevin Crameri OAM then spoke against the motion and raised a number of issues concerning Item 1- St Marys Release Area – Public Exhibition of draft Western and Central Precinct Plans. The Chair, Councillor Ross Fowler OAM noted the issues raised by Councillor Crameri OAM and advised him that he would be provided with a memorandum in response to the issues raised. On being PUT to the meeting the MOTION was CARRIED. Councillor Kevin Crameri OAM requested that his name be recorded as having voted against the Motion. His Worship the Mayor, Councillor Jim Aitken OAM returned to the meeting, the time being 8.32 pm and resumed the Chair. 58 RESOLVED on the MOTION of Councillor Ross Fowler OAM seconded Councillor Greg Davies that the information contained in the report on Community and Cultural Development Department - Projects and Key Achievements - 1 July 2008 - 31 December 2008 be received. 59 RESOLVED on the MOTION of Councillor Ross Fowler OAM seconded Councillor Greg Davies that the information contained in the report on Council Representation on the Board of Directors of The Museum of Fire be received. 1. The information contained in the report on Safer Suburbs Funding - Cranebrook Street & Pedestrian Lighting Upgrades be received. 2. Council accept the grant funding from the Federal Attorney General’s Department, Safer Suburbs Funding, in the amount of $300,000. 3. Council write a letter thanking the Federal Attorney General for the grant funding for enhanced street lighting. 1. The information contained in the report on the Establishment of Alcohol Free Zones & Alcohol Free Areas be received. 2. Council approve the establishment of Alcohol Free Zones and Alcohol Free Areas at the locations identified in this report. 1. The information contained in the report on Selective Tender Reference 05-08/09 Glenmore Park Child & Family Precinct be received. 2. A contract for the Construction of the Glenmore Park Child & Family Precinct, including the new sub station and solar panels, be awarded to Denham Constructions Pty Ltd, for the lump sum fixed price of $6,088,679.30, including GST. Councillor Greg Davies requested that a memorandum be issued to all Councillors of the Council’s Policy on the payment of Award payments to staff and contractors. Having previously declared a pecuniary interest in this matter, Councillor Ross Fowler OAM left the meeting, the time being 9.00pm. Councillor Greg Davies left the meeting, the time being 9.02pm. 1. The information contained in the report on Riverlink Precinct Planning - Baseline Studies be received. 2. Council endorse the approach of sharing the cost for Riverlink Precinct studies with the landowners, as outlined in this report. Councillor Ross Fowler OAM returned to the meeting, the time being 9.03pm. 1. The information contained in the report on Development Application 09/0034 for Alterations & Additions to Existing Respite Centre at 7 Urbane Street, Leonay be received. 2. The objection to the minimum landscaped area provision under Clause 12 of Penrith LEP 1998 pursuant to State Environmental Planning Policy No. 1 – Development Standards be supported. - The eastern wall is required to achieve an FRL of 90/90/90 to achieve compliance with the BCA. 2.22 The existing hours of operation are to be maintained. 2.23 Employees are to utilise the car parking provided on-site to minimise the number of vehicles located on Urbane Street. 2.24 A waste management plan is to be submitted to the Principal Certifying Authority prior to the issue of a Construction Certificate. 1. The information contained in the report on ICLEI World Congress and North American Study Tour be received. 2. Craig Butler, Director, attend the ICLEI World Congress and North American Study Tour. 1. The information contained in the report on NSW Urban Sustainability Program Grant for the Werrington Creek Rehabilitation and Community Engagement Project be received. 2. Council endorse the action taken to secure the grant for the Werrington Creek Rehabilitation and Community Engagement Project. 3. Council send letters of thanks to the Member for Londonderry, Allan Shearan and the NSW Environment Trust. 1. The information contained in the report on Provision of Banking Services be received. 2. Council call for Expressions of Interest for the provision of banking services for the period 1 July 2009 to 30 June 2015. 1. The information contained in the report on Summary of Investments & Banking for the period 1 February 2009 to 28 February 2009 be received. 2. The Certificate of the Responsible Accounting Officer and Summaries of Investments and Performance for the period 1 February 2009 to 28 February 2009 be noted and accepted. 3. The graphical investment analysis as at 28 February 2009 be noted. 1. The information contained in the report on 2009 Australian Local Government Association (ALGA) National General Assembly of Local Government be received. 2. Council nominate the Mayor, Councillor Jim Aitken OAM as Council’s voting delegate for the 2009 National General Assembly of Local Government. 3. Council nominate Councillor Ross Fowler OAM to attend as an observer at the 2009 National General Assembly of Local Government. 4. Leave of Absence be granted to all Councillors attending the 2009 National General Assembly of Local Government to be held in Canberra from 21-24 June 2009. 5. A further report detailing suggested motions be considered at Council’s Ordinary Meeting to be held on 6 April 2009. Councillor Kevin Crameri OAM left the meeting, the time being 9:10pm. Councillor Kevin Crameri OAM returned to the meeting, the time being 9:15pm. 1. The information contained in the report on Movement of two District Courts from Penrith to the Parramatta Justice Precinct be received. 2. The Mayor respond to the Chief Judge of the District Court and the Attorney General pressing for the restoration of the two District Courts in Penrith and advising that Council does not accept that the Attorney General has no influence over the decision to transfer two District Courts at Penrith to Parramatta. 3. Copies of the letters to the Chief Judge of the District Court and the Attorney General be forwarded to Local Members for Penrith, Mulgoa, Londonderry, Smithfield and Blue Mountains. 4. The Council write to the local Members of Parliament seeking their support in pressing the Chief Judge and the Attorney General not to transfer the two District Courts from Penrith. 2. The Mayor respond to the Chief Judge of the District Court and the Attorney General pressing for the restoration of the two District Courts in Penrith and questions whether the Attorney General has no influence over the decision to transfer two District Courts at Penrith to Parramatta. On being PUT to the meeting, the AMENDMENT was LOST. On being PUT to the meeting, the MOTION was CARRIED. 71 RESOLVED on the MOTION of Councillor Tanya Davies seconded Councillor Kath Presdee that the information contained in the report on Economic Outlook be received. 2. Council borrow the amount of $19,834,400 on 5, 10 or 15 year repayment schedules. 3. Council’s General Manager be authorised to negotiate appropriate loan terms in accordance with this report and resolution. 5. The final terms and conditions of the borrowings be reported to Council upon completion of the contracts. Councillor Tanya Davies requested a memo reply concerning the provision for disabled parking bays at Erskine Park Village and investigation into installation of disability ramp adjacent to parking bays. Councillor Ross Fowler OAM requested a report to Council on the development application for extension of hours to this Child Care Centre, and also that the resident be responded to in writing. Councillor John Thain requested a memo reply regarding provision for safety measures to be considered at the intersection at Lethbridge Avenue, John Oxley Avenue & Princess Street, Werrington County. Councillor John Thain requested a matter be referred for consideration in Committee of the Whole as the matter refers to advice concerning litigation, or advice that would otherwise be privileged from production in legal proceedings on the ground of legal professional privilege and discussion of the matter in open meeting would be, on balance, contrary to the public interest. Councillor Kath Presdee requested Council investigate the intersection of Tasman Street and Dunheved Road, Cambridge Park to determine whether it would be possible to widen the road (Tasman Street), to alleviate build up of traffic caused by cars attempting to turn left onto Dunheved Road. Councillor Karen McKeown requested a report to Council investigating the approval of a DA for a business next to premises 71 Maxwell Street, South Penrith. Report should provide information on why the application was approved despite original refusal reasons apparently still existing. Councillor Prue Guillaume requested a report to the next Council meeting updating Councillors on the Former Air Services Site – Cranebrook that was resolved by Council on 4 August 2008, particularly pertaining to efforts to lobby the State Government to acquire the site and the status of Council’s action to pursue an E2 zoning. Councillor Kaylene Allison requested a memo reply to all Councillors regarding the possibility of Council facilitating the collection of E-Waste. Councillor Kaylene Allison requested that a letter be forwarded to Christina Cross, a resident of St Clair, congratulating her on being chosen as one of three NSW finalists and wishing her luck at the announcement ceremony being held Monday 30 March 2009. Councillor Mark Davies requested a memo reply regarding the poor condition of new footpath along Russell Street, Emu Plains. Councillor Jim Aitken OAM requested that an amount of $5,000 divided equally from all 3 Wards Voted Works be allocated for the above scholarship. 73 RESOLVED on the MOTION of Councillor Jim Aitken OAM seconded Councillor Mark Davies that the matter be brought forward and dealt with as a matter of urgency. His Worship the Mayor, Councillor Jim Aitken OAM, ruled that the matter was urgent and should be dealt with at the meeting. 74 RESOLVED on the MOTION of Councillor Jim Aitken OAM seconded Councillor Mark Davies that an amount of $5,000 divided equally from all 3 Wards Voted Works be allocated for the above scholarship. Councillor Greg Davies requested that a report be brought back to Council on the possibility of establishing the scholarship as a part of Council’s annual scholarship program. 75 RESOLVED on the MOTION of Councillor Greg Davies seconded Councillor Kevin Crameri OAM the meeting adjourn to the Committee of the Whole to deal with the following matters, the time being 10:07pm. Councillor Mark Davies left the meeting, the time being 10:08pm. Councillor Mark Davies returned to the meeting, the time being 10:10pm. This item has been referred to Committee of the Whole as the report refers to information that would, if disclosed, confer a commercial advantage on a person with whom the Council is conducting (or proposes to conduct) business and discussion of the matter in open meeting would be, on balance, contrary to the public interest. This item has been referred to Committee of the Whole as the matter refers to advice concerning litigation, or advice that would otherwise be privileged from production in legal proceedings on the ground of legal professional privilege and discussion of the matter in open meeting would be, on balance, contrary to the public interest. 1. The information contained in the report on Commercial Matter - Council Property - Assignment of Lease from Scott Coleman to proposed new tenant Tammie Plevey over Shop 5 Diamond Hair & Beauty Salon at Cranebrook Village Shopping Centre be received. 2. Council grant Scott Coleman an Assignment of Lease to Tammie Plevey in accordance with the terms and conditions as outlined in the report. CW3 That the information on Legal Matter - 8 Donohoes Road, Mulgoa be received. 76 RESOLVED on the MOTION of Councillor Kath Presdee seconded Councillor Greg Davies the recommendation contained in the Committee of the Whole and shown as CW2 and CW3 be adopted. There being no further business the Chairperson declared the meeting closed the time being10:19pm. Anyone can request permission to address a meeting, providing that the number of speakers is limited to three in support of any proposal and three against. Any request about an issue or matter on the Agenda for the meeting can be lodged with the General Manager or Public Officer up until 12 noon on the day of the meeting. Prior to the meeting the person who has requested permission to address the meeting will need to provide the Public Officer with a written statement of the points to be covered during the address in sufficient detail so as to inform the Councillors of the substance of the address and a written copy of any questions to be asked of the Council in order that responses to those questions can be provided in due course. In addition, prior to addressing the meeting a person addressing Council or Committee will be informed that they do not enjoy any privilege and that permission to speak may be withdrawn should they make inappropriate comments. It should be noted that speakers at meetings of the Council or Committee do not have absolute privilege (parliamentary privilege). A speaker who makes any potentially offensive or defamatory remarks about any other person may render themselves open to legal action. “I (name) understand that the meeting I intend to address on (date) is a public meeting. I also understand that should I say or present any material that is inappropriate, I may be subject to legal action. I also acknowledge that I have been informed to obtain my own legal advice about the appropriateness of the material that I intend to present at the above mentioned meeting”. Should a person fail to sign the above statement then permission to address either the Council or Committee will not be granted. The Public Officer or Minute Clerk will speak to those people who have requested permission to address the meeting, prior to the meeting at 7.15pm. It is up to the Council or Committee to decide if the request to address the meeting will be granted. Where permission is to be granted the Council or Committee, at the appropriate time, will suspend only so much of the Standing Orders to allow the address to occur. The Chairperson will then call the person up to the lectern or speaking area. · The interest of the speaker (e.g. affected person, neighbour, applicant, applicants spokesperson, interested citizen etc). Each person then has five minutes to make their address. Those addressing Council will be required to speak to the written statement they have submitted. Permission to address Council is not to be taken as an opportunity to refute or otherwise the points made by previous speakers on the same issue. The Council or Committee can extend this time if they consider if appropriate, however, everyone needs to work on the basis that the address will be for five minutes only. Councillors may have questions about the address so people are asked to remain at the lectern or in the speaking area until the Chairperson has thanked them. When this occurs, they should then return to their seat. Deputy Mayor Councillor Ross Fowler OAM, Councillors Kaylene Allison, Robert Ardill, Kevin Crameri OAM, Greg Davies, Mark Davies, Jackie Greenow, Prue Guillaume, Marko Malkoc, Karen McKeown, Kath Presdee, and John Thain. Leave of Absence was previously granted to His Worship the Mayor, Councillor Jim Aitken OAM for the period 30 March 2009 to 2 April 2009 inclusive. Apologies were received from Councillors Tanya Davies and Ben Goldfinch. The minutes of the Policy Review Committee Meeting of 9 March 2009 were confirmed. Councillor Kath Presdee declared a Non-Pecuniary Conflict of Interest – Less than significant in Item 2 Penrith Whitewater Stadium – Annual Report and Board of Directors as she is a Director on the board of Penrith Whitewater Stadium Ltd.
Councillor Kevin Crameri OAM declared a Non-Pecuniary Conflict of Interest – Less than significant in Item 2 Penrith Whitewater Stadium – Annual Report and Board of Directors as he is a Director on the board of Penrith Whitewater Stadium Ltd.
Councillor Ross Fowler OAM declared a Non-Pecuniary Conflict of Interest – Less than significant in Item 2 Penrith Whitewater Stadium – Annual Report and Board of Directors as he is a Director on the board of Penrith Whitewater Stadium Ltd.
2. Council agree to underwrite the operation of the Penrith Whitewater Stadium Limited until the presentation to Council of the Penrith Whitewater Stadium Limited Annual Report for 2008-09. 3. Council note and endorse the Board’s nominations of Helen Brownlee OAM and Andrew Pearse as continuing Directors of Penrith Whitewater Stadium. 4. Council congratulate the management and staff for their achievements over the last year. 2. A Working Party be established and made up of Councillors Kaylene Allison, Kevin Crameri OAM, Ross Fowler OAM, Jackie Greenow, Prue Guillaume, Karen McKeown , John Thain and all other available Councillors. 3. The Terms of Reference for the Working Party be as set out in the report on Future Directions in Library Services. 2. The improvements to Council’s tender processes as set out in the report to the Policy Review Committee be adopted. The meeting closed to consider Confidential Business, the time being 8:18pm. Councillor John Thain advised the meeting that he had an item to be considered in Confidential Business, being a personnel matter concerning particular individuals and discussion of the matter in an open meeting would be, on balance, contrary to the public interest. This item has been referred to Confidential Business as the report refers to commercial information of a confidential nature that would, if disclosed (i) prejudice the commercial position of the person who supplied it; or (ii) confer a commercial advantage on a competitor of the Council; or (iii) reveal a trade secret and discussion of the matter in open meeting would be, on balance, contrary to the public interest. The item has been referred to Confidential Business as it refers to personnel matters concerning particular individuals and discussion of the matter in open meeting would be, on balance, contrary to the public interest. The meeting moved out of confidential session at 9:18pm and the General Manager reported that after excluding the press and public from the meeting, the Policy Review Committee met in confidential session from 8:18pm to 9:19pm to consider a commercial and personnel matter. 1. The information contained in the report on Commercial Matter - Council Property - Cranebrook Village Shopping Centre be received. 2. Council publicly communicate its intentions in relation to the Centre. 3. A further report be presented to Council following responses to the Expression of Interest, leading to a Tender process. That the information on Executive Staffing Position be received. There being no further business the Chairperson declared the meeting closed the time being 9:21pm. That the recommendations contained in the Report and Recommendations of the Policy Review Committee meeting held on 30 March, 2009 be adopted. Strategic Program Term Achievement: A commonly shared long-term vision for the City underpins strategic collaboration and community engagement. Critical Action: Prepare, implement and review Strategic Plans and processes. To present the draft Strategic Plan and 4 Year Delivery Program 2009 - 2013 for Council's consideration and endorsement for public exhibition. The report recommends that the draft Strategic Plan and 4 Year Delivery Program 2009 - 2013 be endorsed for exhibition. The presentation of the draft Strategic Plan and the 4 Year Delivery Program 2009 – 2013 represents the culmination of a significant research and engagement process with Council and the community over the last several months. The draft Strategic Plan is prepared as Council’s principal policy document, guiding its leadership of the City beyond the next ten years. The draft Strategic Plan identifies the priorities of the Council and the City’s communities, and outlines long term strategies for achieving these goals. The Plan is the result of an extensive and staged program of engagement which has been undertaken through workshops and briefings with Councillors, key stakeholders and partners through the City Futures Forum and with staff through a targeted survey. The commentary captured has been blended with the existing path established through past Strategic Plans and the Penrith’s Principles for a Sustainable City to produce the draft Strategic Plan. Proposed new legislation addressing the statutory management planning processes of Council had to be taken into consideration. These changes include the requirement for Council to develop 10 year+ strategic plans, 4 year delivery program plans, and yearly operational plans with an accompanying regime of periodic reporting. Notwithstanding the fact that they are not yet a legal requirement of Council, and consistent with Council’s role as a leader in management planning, the current draft documents have been prepared to match the intent of the new legislation and should enable smooth transition upon its introduction. The draft 4 Year Delivery Program supports the Strategic Plan, and covers the years from 2009 through to 2013. The Delivery Program sets out in more detail what actions and activities the Council will undertake to contribute to the long term strategic directions. The Delivery Program contains information on all of Council’s programs and responsibilities, related services, key actions and their direct links back to the Strategic Plan. The 4 year Delivery Program will be supported by a series of annual Operational Plans (previously referred to as Management Plans). The Operational Plans will include actions and tasks to be undertaken to achieve the Delivery Program’s four year actions and will be the subject of a separate exhibition process. Council has undertaken a significant coordinated program of research and engagement with the community and stakeholders to capture a wide range of opinion as to the future direction for the City. The sifting and blending of this opinion has resulted in the development of an aspirational Plan, founded upon Penrith’s Principles for a Sustainable City. Each of the themes are more extensively described in a narrative. The narrative provides a fuller context. They outline how the theme relates to the Sustainability Principles and the particular delivery programs which contribute to the theme. A significant aspect of the Strategic Plan is how easy it is for the City’s communities to use and understand. The Strategic Plan is aimed at outlining longer term goals for the City and the Council as an organisation. Previous Strategic Plans have not provided an ‘end date’ for their strategic directions. In this regard, our consultations have demonstrated that being clearer about the ‘horizon’ for the Strategic Plan, whether it be 20 or 25 years, or a specific date (eg Melbourne 2030) will assist in our ongoing engagement and discussions with the City’s communities. In this regard, for example, the State Government’s Metropolitan Strategy identifies strategic actions with a horizon of 2031. The Metropolitan Strategy has been useful in informing the directions developed through Council’s current strategic planning process. During the exhibition period further discussions on this approach will be pursued. The Delivery Program establishes the actions that will be undertaken over the 4 years of the program to achieve the Strategic Plan directions. The delivery actions have been prepared in an aspirational context to ensure that the spirit of the Strategic Plan is not lost in its delivery. As such, it has been recognised that some components of the Delivery Program may presently suffer from inadequate resource allocation. A separate process will be undertaken with the development of the yearly Operational Plans to consider the impact of resource levels and enable Council to determine priorities. To continue the process of engagement with the community and our partners, it is proposed to exhibit the Strategic Plan and the 4 Year Delivery Program 2009- 2013 together and, seek submissions for a 28 day period starting Tuesday 21 April through to Monday 18 May 2009. This public exhibition period provides the community with a genuine opportunity to provide feedback on both format and content of the documents. Feedback and input on the draft documents will be actively sought by Council during the exhibition period. · Information displayed in Council’s foyer during the exhibition period, as well as the distribution of approximately 90 mini-displays to facilities across the local government area previously used for Management Plan exhibition. Further details of specific components of the program are provided below. It is intended to notify the City’s communities of the draft Strategic Plan 2009+and draft Delivery Program 2009-2013 exhibition through all local newspapers. In the case of weekly newspapers, advertisements will be placed to coincide with the first and third weeks of the exhibition. Monthly local newspapers (Mulgoa Gazette, Glenmore Gazette etc.) will also be used wherever practicable. The notice will include a brief indication of the importance and content of the draft Plans and how the community can make submissions on the draft documents. Council will be using several online tools to engage the City’s communities in providing feedback on both the Strategic Plan 2009+ and Delivery Program 2009-2013. Bang The Table is one tool that provides the opportunity for online forums to discuss aspects of the exhibited documents and to enable informal dialogue with Council to clarify the intent or context of any element of the documents prior to making a formal submission. Formal input will be facilitated through the use of an online survey, which will guide the respondent through a formal response process. Links to each of these sites will be identified in all advertisements and on Council’s own webpage. It is intended, in addition to the formal consultation mechanisms, to use other established meetings and forums with the community and stakeholders over the exhibition period to promote and obtain commentary on the draft Strategic Plan and draft 4 year Delivery Program. The closing date for submissions on the draft Strategic Plan and draft Delivery Program is proposed to be Monday 18 May 2009. In keeping with Council’s normal practice, all official submissions received will be individually acknowledged and a detailed response provided by appropriate officers as soon as possible, reflecting Council’s established policy or following Council’s determination of the particular issue. A full summary of public submissions will be included in the report to Council in June 2009, which will seek formal adoption of the draft Strategic Plan and draft Delivery Program 2009-2013. Subject to any amendments arising from Council’s consideration of the draft Strategic Plan and the 4 Year Delivery Program 2009 – 2013 at tonight’s meeting, the documents are now submitted for Council’s endorsement to enable its public exhibition. 1. The information contained in the report on Endorsement for Exhibition of the Draft Strategic Plan and 4 Year Delivery Program (2009 - 2013) be received. 2. Council endorse the draft Strategic Plan and draft 4Year Delivery Program for exhibition. Strategic Program Term Achievement: Penrith Lakes is developing and being used in a way that establishes it as a principal Sydney destination. Critical Action: Participate in the planning process for Penrith Lakes and advocate its innovative development as a regional centre for enterprise, water based recreation elite sports, entertainment and events. The Great River Walk (GRW) is a significant initiative that Council has been pursuing for many years, through a range of funding sources including Council, State and Federal Government grants and private contributions. The project is part of Council’s Major Projects model, through which the funding and expenditure of significant multi-year projects are managed. A major source of funding for the GRW has been the Metropolitan Greenspace Program (MGP). In 2009, the Department of Planning will provide over $2.4 million to Councils in the Sydney metropolitan region, under the Program, on a dollar for dollar basis. The 2009 MGP – Building Sydney’s Recreation Trails, is again focused on partnerships with local Councils to deliver projects that will add to Sydney’s recreation trail network or associated parklands, foreshores and bushland corridors. In 2008, a total of 38 successful projects were approved under the Program, with grants totalling over $2,400,000. Of this, over $2,000,000 was provided for the development of regional recreational trails. To date, Penrith City Council has received a total of $811,042 for the GRW, under the MGP grant program. The following details the implementation of the GRW and the associated grant applications. Grant application currently being prepared (the subject of this report). The River Road Plan of Management was adopted by Council in January 2008 and was prepared in response to residents concern for the riverbank, including weeds and the visual amenity. Whilst the Plan extends from Regatta Park south to Lapstone Place there are a number of elements north of the M4 bridge that relate to the GRW, such as kerb and gutter, bush regeneration / weed management and GRW pathworks. In this regard, the implementation planning for the GRW and the Plan of Management have been co-ordinated. The Department of Planning requires the submission of grant applications for the 2009 MGP in April. It is proposed to lodge an application for Stage 7 of the Walk, which is located on the western side of the river, an area already popular with locals and visitors and in need of improvement. Stage 7 involves construction implementation and is based on the designs and documentation prepared by consultants in Stage 4 (West Bank design). 1. 1km of 2.5m wide shared pedestrian cycle path adjacent to new kerb and gutter along River Road, between Regatta Park and Dewdney Rd – includes special structural edge treatment and handrail due to embankment grades. This component is the bulk of the funds required and directly associated with the kerb and gutter works. Should this funding application be successful, the timing for construction will follow the continuity of kerb, gutter and drainage works on River Road (a City Works project, budgeted for implementation in stages, commencing in 2009-10). Most of Council’s matching funds would be required in 2010-11 with a small percentage required in 2011-12. Council is awaiting clarification as to whether the kerb, gutter and drainage works can be incorporated into the grant, as an integral component to the pathway, so as to reduce the amount of Council funds required for the project. Of Council’s contribution towards this project, $40,000 has been secured from Parks Construction and Maintenance over the next three years (item 2 in the table above). This is an Enhanced Environmental Program (EEP) allocation for bush regeneration and weed management works along the River Road embankment (an action in the River Road Plan of Management). By including this allocation in the grant application, the matching grant funds ($40,000) will be dedicated towards both extended bush regeneration / weed management works and general landscaping works. At the time of the authoring of this report, more detailed cost estimates prepared by a Quantity Surveyor had not yet been prepared, however the landscape consultant had provided some preliminary guideline estimates. It is expected there will be greater certainty of project cost estimates prior to the grant application being lodged, however the estimates contained in this report will provide an indication of scale of costs. As part of the Federal government’s stimulation package there is a $300m program that is aimed at job creation projects. Of this amount $60m has been preserved for heritage projects including heritage walking trails. The guidelines for these grants are not likely to be known for possibly another month, it would appear that, as this section of the GRW would have construction documentation and DA approval by July, it could be a contender for funding. Whilst the timing does not align with the MGP submission dates, it is proposed that the application contains two project scope options: Option 1 (Federal funding is not successful, reflecting the above financial summary table) and Option 2 (Federal funding is successful, in which the scope and value of the MGP grant application would be modified). The preferred option will be able to be confirmed to the Department of Planning once Federal funding notification has been received, which is expected prior to the determination of MGP grants. Acceptance of this Grant will commit Council to matching contributions of up to $283,000 pending the response to Council’s proposal to include the kerb and gutter works as part of our contribution to the project. If the application is successful, the funds will be required in the 2010-11 financial year. Previously Council’s matching contribution for the Great River Walk Stage 6 was provided from the Penrith District Open Space Section 94 plan. This plan also includes funding of a number of other high priority programs, such as Gipps Street development, and has a budgeted deficit of $314,972 as at 30 June 2009. In addition there is some uncertainty around the future of this plan pending the outcome of the current review of developer contributions and an alternate source of funding may need to be identified should this plan no longer exist in its current format. Council’s Long Term Model is currently forecasting a deficit for the 2010-11 financial year so the opportunity to fund Council’s matching contribution from general revenue is unlikely unless savings can be identified for this purpose. However, as the funds are not required until 2010-11 it is suggested that the application should proceed and the funding source be further considered when the outcome of the application is known. By then the uncertainties around the Penrith District Open Space developer contribution plan should be resolved and Council will be better placed to consider the funding implications. The MGP has supported the GRW in Penrith with grant funding since 2003. This stage will continue the GRW momentum achieved to date as well as demonstrate obvious interventions in line with the River Road Plan of Management. Whilst the scope of works and costs are yet to be confirmed, pending more information and determination of the Federal grant, an MGP grant application for Stage 7 is able to be submitted for assessment. 1. The information contained in the report on Great River Walk Stage 7 Grant Application be received. 2. Council endorse the lodgement of the application for the 2009 Metropolitan Greenspace Program grant for the Great River Walk Stage 7. Strategic Program Term Achievement: Council's planning approach to the provision of housing across the City addresses the supply, choice, affordability, economic, social diversity and workplace needs of the community. Critical Action: Review the effectiveness of Councils Residential Strategy, ensuring that it addresses the current and emerging, supply, choice, affordability, and social and economic diversity needs of the City's communities. To inform Council of problems relating to high front guttering to buildings. The report recommends that the information be received and that Council advise the Minister for Fair Trading on this issue. (b) There are insufficient separation distances between the guttering and fascia to account for possible stormwater overflow discharges. This may result in stormwater being discharged directly to the roof space causing damage to building elements as well as creating unhealthy and mouldy conditions. Ms Hale indicates this concern has been supported by professional organisations such as Archicentre, the Timber Development Association and the Master Builders Association. Ms Hale requests reports be prepared on this issue to alert Councillors to the problem. If supported by Council, Ms Hale recommends Council write to the Minister for Fair Trading requesting appropriate action is taken. Councillor Kevin Crameri OAM has requested this report be prepared for Council’s consideration. F1.1 of the Building Code of Australia (Volume 1) and 3.5.2.0 of the Housing Provisions (Volume 2 of the BCA) requires guttering to comply with Australia Standard AS3500.3. The issue of stormwater overflow is a major concern for the BCA and it aims to ensure the building is protected from stormwater penetration. AS3500.3 deals with overflow measures and provides some examples on how guttering can be installed. Images (b) and (c) in Figure G1 of the Standard relate to high front gutters and both allow for the overflow of stormwater to the outside of the building in the event of peak flows (Refer Figure G1 from AS3500.3 below). In all of the diagrams below, the roof is located to the left. Image (b) shows a section of the system with a flashing attached to the rafters and wrapped over the fascia behind the guttering. The flashing extends onto the roof for a distance higher than the lip of the guttering. This distance is shown in the figure as hf to the right of the section (refer diagram). The height hf relates to a distance in millimetres and is designed to cope with stormwater overflows during periods of peak rainfall. Without the design component hf, stormwater is likely to flow inside the roof space and damage the building elements. The distance of hf varies for the type of guttering used but it is in the range of 18 mm to 25 mm for a level gutter and 12 mm to 19 mm for a sloping gutter. Image (c) is an alternative for high front gutters. In this example, the gutter is offset 10 mm from the fascia. The hf value is this example is the distance measured from the top of the fascia to the top of the inside of the guttering. This allows for water to flow between the gutter and the fascia during periods of heavy rainfall. The guttering identified by Ms Hale does have some overflow slots cut into the profile. These are small in area, far too few in number and the friction losses would not permit water to flow freely through them. The slots are not considered an equivalence for the hf stormwater overflow provision as shown in the standard details above. The slots will not cope as an overflow mechanism during periods of peak rainfall. The guttering identified by Ms Hale utilises a metal clip fastener. These are positioned along the fascia at intervals predetermined by the manufacturer to cope with the expected loading of the guttering when it is full of water. The clips work by attachment to the fascia and inside hooks that grip the downturned internal edge of the guttering. Even if the attachment of the guttering on the clip fastener is at the lowest point, the gutter still does not comply with the hf overflow provision in Image (a) of Figure G1. An additional problem with a low attachment is the exposure of the clips to public view and this is aesthetically undesirable. Clearly the high front gutter identified by Ms Hale does not comply with AS3500.3. Council’s Professional Staff have been alerted to this issue and are now insisting on compliance with the Standard. (a) Produce a circular advising all relevant building industry personnel of the necessity to comply with the Building Code of Australia and that the provision of “slots” in high-fronted guttering is not sufficient to ensure compliance. (b) Illustrate the circular with diagrams indicating methods of installation that do comply. (c) Distribute it to all industry associations and ask them to distribute it to all their members. (d) Give a copy to all relevant licence holders (not solely plumbers) when their licences come up for renewal. (e) Approach the manufacturers and require them to place a warning on their website about the need for compliance with the BCA. (f) Require manufacturers to provide all purchasers of high-front guttering with a copy of the warning and diagrams that illustrate compliant methods of installation. (g) Vet the wording of these warnings so that the nature of the problem is made absolutely clear. (h) Encourage manufacturers to modify their installation systems so that they are fit for purpose and comply with the Building Code of Australia. (i) Ensure that manufacturers and suppliers of gutter remove all false and misleading information from their websites, advertising and brochures. It is recommended that Council support this approach and also write to the Minister for Fair Trading highlighting the issues raised by Ms Hale above. A copy of Ms Hale’s comments will be provided under separate cover to Councillors. Council can also advise the Minister it has alerted its staff to this issue and we will only approve guttering systems that comply with AS3500.3. 1. The information contained in the report on High fronted guttering to buildings be received. 2. Council agree with the concerns raised by Ms Sylvia Hale MLC and write to the Minister for Fair Trading expressing its concern. 3. Council also advise the Minister for Fair Trading it will only be approving guttering that complies with AS3500.3. Strategic Program Term Achievement: Redevelopment of existing areas contributes to safe, sustainable, affordable and satisfying living environments and cohesive communities. Critical Action: Formulate and implement social and cultural strategies for redeveloping established areas that support cohesive communities. To seek endorsement of Council to vary the proposed lot density using an objection under the State Environmetal Planning Policy No. 1. The report recommends approval subject to conditions. A previous application lodged in March 1996 for a proposed subdivision of the subject property was refused by Council. This application did not submit adequate information to indicate the proposal was compatible with the surrounding development, adequately serviced, provided any landscaping or was accompanied by a SEPP No. 1 Objection to support the application. An application was submitted on the 29 June 2004 for an attached Dual Occupancy which was approved the development has been since been constructed. The subject site is situated on the northern side of Garswood Road west of the intersection of The Northern Road and opposite Penrith Golf Course. It is 1.759ha in area, is orientated in a north south, direction and has a gentle slope from the rear to Garswood Road (see Locality Plan at Appendix No. 1). The site is currently occupied by two dwellings, forming an attached dual occupancy and outbuildings (see Site Plan & Plan of Subdivision at Appendix No. 2). The surrounding area is characterised by residential and rural/residential development. Proposed is a Torrens Title subdivision of one into two lots. Proposed lot 4210 will have an area of 4004 m2 and a frontage of 54.18m to Garswood Road. Proposed lot 4211 will have an area of 1.358ha with a frontage of 50m. This is an L shaped lot and contains the existing buildings on the site which are setback 65m from Garswood Road. The development includes landscaping to reinforce the existing native vegetation in the area. The site is proposed to be connected to the sewer of Sydney Water. The proposed vacant lot 4210 has adequate flexibility for the siting of a dwelling without impacting on the existing vegetation on the proposed lot. The applicant proposes landscaping on the site along the eastern boundary of the site and the proposed north and western subdivision boundaries to further enhance the site and minimise any visual impact of future development. An objection under the State Environmental Planning Policy No. 1 Development Standards (SEPP No. 1) has been submitted with the application in regard to the lot density provision of the LEP. The subject site is zoned 2(r) Rural- Residential under Local Environment Plan 1998 Urban Lands. The proposed development is defined as Torrens Title subdivision, which is permissible with the consent of Council. The lots to be created satisfy the minimum area requirement of 4000 m2 as outlined in the above clause. The lot increases in width with depth and has suitable area for the location and siting of a future dwelling, so as to provide adequate setbacks and separation provided from existing dwellings in the surrounding area. The site density is greater than one lot per hectare as required in the LEP. The subject lot has an area of 1.759 ha and the subdivision will create 2 lots resulting in a density of more than 1 lot per hectare for this lot. To support this variation of density an objection pursuant to State Environmental Planning Policy No. 1 Development Standards has been submitted on the basis that the zone density will not exceed one lot per hectare. “provides flexibility in the application of planning controls operating by virtue of development standards in circumstances where strict compliance with those standards would, in any particular case, be unreasonable or unnecessary or tend to hinder the attainment of the objects specified in Section 5 (a)(i) and (ii) of the Act”.. It is considered that the development control pertaining to density is sufficiently defined as a ‘development standard’, and thus a SEPP 1 objection can be considered by Council. Where development could, but for any development standard, be carried out under the Act (either with or without the necessity for consent under the Act being obtained therefore) the person intending to carry out that development may make a development application in respect of that development, supported by a written objection that compliance with that development standard is unreasonable or unnecessary in the circumstances of the case, and specifying the grounds of that objection. · The development will maintains the prevailing settlement pattern as the development will almost be imperceptible in the local landscape from both adjacent road corridor and existing rural residential development to the west. · A planning assessment of the proposed development reveals that although the subdivision provides lots at greater density allowed under the relevant zone provision, it is considered to still satisfy the underlying development standard and the dwelling density of the broader zone. · Accordingly, it is considered that strict compliance with the development standard is both unreasonable and unnecessary in the circumstances of the case. The proposal satisfies these objectives of the zone as the semi rural character is maintained with any future dwelling on the site not being visible from The Northern Road due to existing development and landscaping. The site will be further landscaped to enhance its rural character and provide additional screening from the surrounding area. The 2(r) zone has a total area of 5.044 ha and currently the zone consists of 4 lots having a density greater than 1 lot per hectare. The approval of the subject application would result in 5 lots in total and a density of 1 lot per hectare across the zone. No further subdivision of lots would be available in the zone. The objectives of the zone are achieved in regard to lot area and density. The objection has adequately addressed those matters prescribed in State Environmental Planning Policy No.1- Development Standards, and has demonstrated that compliance with the prescribed minimum lot density is unnecessary in the circumstances of the case. As the proposal satisfies the design and minimum area standards for the proposed lots and the density requirement is complied with for the total area zoned 2(r), the SEPP No1 objection is supported. A recent circular published by the Department of Planning in the wake of the ICAC investigation of Wollongong City Council has advised that all development applications, where there is a variation to a development standard greater than 10%, should be determined by full Council. The current proposal although giving an overall density consistent with the zoned area, has a variation of 12.1% to the development standard requiring a minimum density of one lot per Hectare. As such the proposal has been referred for determination by full Council. Consent may be granted where the consent authority is satisfied that the objection is well founded and is also of the opinion that granting of consent to that development application is consistent with the aims of this Policy as set out in clause 3, it may, with the concurrence of the Director, grant consent to that development application notwithstanding the development standard the subject of the objection referred to in clause 6. The application needs to be referred to the Department of Planning’s for its concurrence. The Department will only consider applications for concurrence after council has considered the application and resolved to support the proposal. The SEPP No1 objection for the variation under Penrith LEP 1998 (Urban Lands) to vary the lot density controls in this application needs be referred to the department for concurrence and this is recommended. Pursuant to Planning Circular PS08-013- Consideration of draft EPI’s under section 79C of the EP&A Act, there are no draft environmental planning instruments applicable to the site. A site inspection was carried out and the proposed development fits the locality. The proposed lot will have sewer provided for any future dwelling and other services are available subject to arrangements with authorities. The site attributes are conducive to the development and the development will be visually in keeping with the semi rural character and amenity of the area. The assessment of the proposal has not identified any matters that would impact adversely upon the public interest. The development will not significantly affect any neighbouring properties in terms of privacy, noise overshadowing or amenity. The proposed subdivision will create an additional lot of 4000 m2 and a lot of 1.358ha the lots comply with the minimum lot area in the zone. The lot to be subdivided does not provide a density of 1 lot per hectare the application proposes a density of 1 lot per hectare across the zone. The objectives of the zone are achieved in regard to lot area and density and lot area. The proposed development satisfies the development standards in the LEP and will be in character with development in the surrounding area. The application requesting a variation to lot density provision in the LEP is supported in these circumstances and the application referred to the Department of Planning for concurrence. 1. The information contained in the report on Development Application 08/0507 - Torrens Title Subdivision into Two Lots at Lot 421 DP 793120 (No. 9 - 17) Garswood Road, Glenmore Park be received. 2. The State Environmental Planning Policy No.1 variation to the Development Standard, lot density be supported. 3. The application be referred to the Department of Planning for concurrence. 4.19 The proposed lots shall be serviced by and all dwellings connected to the sewer of Sydney Water. To report to Council the proposed subdivision of the existing lot containing a dwelling and tennis court into three lots. An application has been submitted with the Land and Environment Court for a deemed refusal. The site is flood affected, the proposal is permitted under the zoning, however it does not comply with Council's policy for subdivision in flood affected areas. The report recommends that the application be refused. Council is in receipt of a development application for a three lot Torrens title subdivision. The applicant did not attend a pre-lodgement meeting. The site is flood liable and located in an area of high hazard. The applicant was advised of the impact of flooding and advised Council would not support the application and requested to withdraw the application. The applicant subsequently lodged an appeal at the Land and Environment Court against the deemed refusal of the application as it has not yet been determined by Council. The appeal was subject of a Section 34 Conference on site on 5 March 2009 aimed at mediating and resolving issues the subject of contention. The issues were explored before the Commissioner of the Court however the matter was not resolved. The appeal has subsequently been set down for hearing on 20 April 2009. A Joint Experts report is being prepared for the hearing by Council’s Major Projects Manager, the applicant’s expert and State Emergency Services. The subject site is situated on the southern side of Forbes Street, Emu Plains and also has frontage to Mclean Street to the south (see Locality Plan Appendix 1). The site is surrounded by low density residential dwellings. The site has an area of 2828m2 and is currently occupied by a residential dwelling, tennis court, associated residential outbuildings and facilities. The site has been landscaped around the existing dwelling and the remainder of the area is lawn. The site is zoned 2 (B) Residential (Low Density) under Penrith Local Environmental Plan 1998 (Urban Land)(LEP). The proposed subdivision is permissible under the zoning and the proposed lots meet the required minimum lot area of 550m2 and minimum lot width of 15m under the zone. 1. The council must not consent to the carrying out of any development on or adjacent to flood liable land unless the provisions of any council policy for the development of flood liable land have been taken into consideration. “The property is affected by flooding from the Nepean River. In a 100 year event a flood runner from Knapsack Creek runs in a northerly direction through Emu Plains towards the railway line. This flood runner flows through the subject property with an approximate depth ranging from 0.3 to 0.6m. The hydraulic hazard on the property ranges from medium to high due to the depths and velocities at the site. The flood runner isolates the property from high ground to the west. The nature of the flooding on the site is such that approval of the development would be contrary to Council’s Interim Flood Policy set out in DCP 2006. Further the NSW Floodplain Development Manual (NSWFDM) requires Council to consider flood events greater than the 100 year flood. In this instance the property it self is inundated but evacuation routes are also cut early in a flood event thus limiting the ability for the occupants to self evacuate. The flood creates an island to the east of the site between the Nepean River and the flood runner. Whilst this island may offer some protection in a 100 year flood it becomes totally inundated in a larger flood. This situation is identified in the NSWFDM as being a high hazard. The SES have previously advised Council that the evacuation of Emu Plains is difficult due the short period between the time a flood event can be predicted to require evacuation and the time that the evacuation routes are cut. The proposed development will add to the current evacuation problems. The site does not have any Draft Environmental Planning Instruments that need to be considered as part of this application. Penrith Development Control Plan 2006 – Part 2.10 Flood Liable Land applies to the proposal. As the subject land is below the standard flood level the proposal is inconsistent with the aims, objectives and provisions of the DCP. In particular, the specific requirements for subdivision are that land situated within existing residential areas may only be subdivided to enable its development for urban purposes where the level of the existing land to be developed is not lower than the standard flood. The application did not contain a flora or fauna report, although it is indicated that no environmental constraints have been identified to impede development. The application does not involve any works or removal of vegetation. The application is for subdivision only and potential sites for new dwellings would be consistent with the current interface with the existing public/private domain. The proposal is for subdivision only and potential sites for new dwellings will provide for consistency with the existing character of the locality. The subdivision will not generate any increase in traffic over the existing development on the site. The existing local road network has ample capacity to accommodate any increase in traffic generated from new dwelling sites following the subdivision. Traffic matters can further be addressed in any future application that will involve an increase in the use of the site. The development would not have any significant impact on the community. The proposed development complies with the permitted uses under the zone for the site and the proposed lots are above the minimum areas required. The site is subject to flooding to a level however that renders the site unsuitable for any increase in residential development resulting in increased population potential hence threat to life and property.. In accordance with Council’s Notification DCP, the proposed development was notified to nearby and adjoining residents. Council did not receive any submissions in response. The proposed application is permitted under the zone and proposed lots are of adequate area however the site is impacted by flooding being located in an area of high hazard and would place future occupants of the lots at risk. The proposal does not therefore comply with Clause 32 of Penrith LEP 1998 (Urban Land) nor Penrith DCP 2006 Part 2.10 Flood Liable Land. Council must proceed to the hearing on this basis to fulfil the intention of its policy, prevent the potential for precedence to be set for subdivision in flood affected residential areas and protect life and property. 3. Councillors be advised of the outcome of the hearing by way of Councillor memo. Strategic Program Term Achievement: Council has reviewed its own role and operations and has adopted contemporary practices to best discharge its charter. Critical Action: Review current structures and procedures supporting Council and Councillors responsibilities. To propose amendments to the 2009 Meeting Calendar which was adopted at the Ordinary Meeting on 8 September 2008. The report recommends that the meetings scheduled for Mondays 22 & 29 June and 6 & 13 July 2009 be rescheduled by one (1) week to Mondays 29 June and 6, 13 & 20 July 2009. Council adopted the 2009 Meeting Calendar at its Ordinary Meeting on 8 September 2008. Circumstances have arisen since the 2009 Meeting Calendar was adopted which necessitate making changes to the Calendar. When Penrith’s Meeting Calendar was fixed for 2009, the date of the 2009 National General Assembly of Local Government was fixed for 19–22 July 2009, and the Calendar thus avoided having a meeting on Monday 20 July 2009. However, the date of the 2009 National General Assembly (NGA) has subsequently changed to 21–24 June 2009 and this now conflicts with the Ordinary Council Meeting to be held on Monday 22 June 2009. This meeting has been earmarked to adopt the Management Plan for 2009/2010. Both the Mayor, Cr Jim Aitken OAM and the Deputy Mayor, Cr Ross Fowler OAM will be attending the National General Assembly. These changes do not affect the number of meetings held of each type and maintain one Ordinary Council Meeting in the months of June and July, as required by section 365 of the Local Government Act 1993. The changes to the calendar have been discussed with the relevant managers and all statutory and operating obligations are able to be met, including adherence to key dates for consideration of Management Plan Quarterly Reviews, 2009-2010 Operational Plan, Strategic Program Progress Reports and 2008-2009 Financial Statements. 1. The information contained in the report on Amendments to 2009 Meeting Calendar be received. · the Policy Review Committee scheduled for 6 July 2009 be rescheduled to 13 July 2009. To submit for Council's consideration, a motion for the 2009 National General Assembly of Local Government. The report recommends that the motion, as detailed, be submitted to the upcoming Assembly. The 2009 National General Assembly of Local Government will be held in Canberra from 21 – 24 June 2009. The 2009 National General Assembly, which is sponsored by the Australian Local Government Association (ALGA), will have as its theme, “Rising to the Challenge - Infrastructure, Financing, Climate Change”. 3. complement or build on the policy objectives of state or territory associations. Motions need to be submitted to the ALGA by no later than Friday 24 April 2009. The following proposed motion, under the theme of ‘Climate Change’, has been identified by the Group Manager Leadership, as a possible issue for which a motion could be framed for debate at the Conference. That this National General Assembly call for action by the Australian Federal, State and Territory Governments to provide detailed modelling of the likely impacts of climate change on the operations and responsibilities of local government, and provide local government with information for best practice adaptation and mitigation strategies so as to effectively respond to this critical issue. This motion seeks to ensure that local governments across Australia have access to the best possible information surrounding the impacts of climate change and best practice mitigation and adaptation strategies so as to improve the capacity of local government to respond to this critical issue. Climate Change has been recognised as one of the greatest long term challenges facing communities globally. Our climate has already changed and is continuing to change at an accelerating rate. Human societies will be forced to adapt and respond, and indeed have already begun to do so. The challenge facing governments and societies alike is to deliver effective responses with minimal social, environmental and economic costs. A truly effective response to climate change requires a dual approach which includes both management and reduction of greenhouse emissions (mitigation), and making adjustments to existing activities and practices so that vulnerability to the impacts of climate change can be reduced and strategies are in place to manage those impacts (adaptation). In addressing this issue, Local Government requires the best possible advice regarding the likely impacts of climate change and the best possible information from which to base mitigation and adaptation activities. Research in this area is beyond the capacity of individual councils or regions, and as such requires the assistance from higher levels of government and the support of agencies, such as the Australian Local Government Association. By identifying the vulnerability of local government to the impacts of climate change, councils and other key stakeholders will be better able to plan for and respond to the environmental, social, and economic challenges that lie ahead. 1. The information contained in the report on 2009 National General Assembly of Local Government Motions be received. 2. The Motion detailed in the report be submitted for inclusion in the 2009 Australian Local Government Association National General Assembly Business Paper. To inform Council of the 2009 Australian Women's Leadership Symposium being conducted on 10 & 11 June 2009 and to seek an indication from Councillors interested in attending. The report recommends that Council consider attendance by interested Councillors at the Symposium. The 2009 Australian Women’s Leadership Symposium will be conducted at the Shangri-La Hotel, The Rocks, Sydney on Wednesday 10 & Thursday 11 June 2009. This Symposium is a national gathering of Australia’s most inspiring women and it is to be held in five key locations throughout Australia. The Symposium will provide a unique opportunity for Australian women to participate in a two-day interactive, leadership master-class delivered by Women and Leadership Australia (WLA) and Australia’s highest achieving women. The cost of registration is $2,360 (standard rate). There are however, a limited number of subsidies available for ‘Women in Local Government’ which would reduce the cost by $1,365 to $995. An indication is sought from Councillors who may wish to attend the Symposium. 2. Council nominate delegates to attend the 2009 Australian Women’s Leadership Symposium being conducted in Sydney from 10 to 11 June 2009. Strategic Program Term Achievement: The organisation is managing its statutory requirements and the needs of a participatory community in a transparent and balanced way. Critical Action: Develop, review and monitor policies and procedures to enable the organisation to engage more effectively with the community while meeting its statutory and public interest obligations. To advise Council of the nomination received from Penrith Whitewater Stadium Ltd for the appointment of a new Board member to fill the vacancy recently created by the resignation of a community representative. The Board seeks Council endorsement of its nomination. The report recommends that Council endorse the appointment of Mr Pat Sheehy AM to the Board of Penrith Whitewater Stadium Ltd.
At the Policy Review Committee Meeting held on 30 March 2009 the Council received a report following the Tenth Annual General Meeting of Penrith Whitewater Stadium Ltd held on 16 October 2008. As advised to Council at the Policy Review Meeting on 30 March 2009, Ms Deborah Waugh tendered her resignation as a community representative on the Board of Directors effective from the date of the Annual General Meeting held on 18 October 2008. Ms Waugh did not seek re-appointment to the Board. The Board has recently considered a nomination of Mr Pat Sheehy AM to fill the vacancy created by Ms Waugh on the Board. As Council is aware Mr Sheehy AM has extensive experience as a Director on the Boards of Council’s controlled entities. He was a former Director on the Board of Penrith Whitewater Stadium Ltd and is a currently a Director on the Board of Penrith Performing and Visual Arts Limited. Mr Sheehy AM has extensive experience in Local Government having served as a Councillor on Penrith City Council for 20 years. Mr Sheehy AM was Mayor of Penrith City Council in 1994/1995, 2001/2002 and 2006/2007. He was the School Principal of Shalvey High School before retiring in 2001. The Board felt that Mr Sheehy AM would be a most suitable replacement for the vacant Director’s position on the Board. As such, the Board has resolved to seek Council’s endorsement of the appointment of Mr Sheehy AM as a Director on the Board of Penrith Whitewater Stadium Ltd.
1. The information contained in the report on Penrith Whitewater Stadium Ltd - Board of Directors be received. 2. Council endorse the appointment of Mr Pat Sheehy AM as a Director on the Board of Penrith Whitewater Stadium Ltd.
Everyone is entitled to attend a meeting of the Council and those of its Committees of which all members are Councillors, except as provided by Section 10 of the Local Government Act, 1993. (b) the receipt or discussion of any of the information so listed. · reveal a trade secret. (g) advice concerning litigation, or advice that would otherwise be privileged from production in legal proceedings on the ground of legal professional privilege. The grounds on which part of a meeting is closed must be stated in the decision to close that part of the meeting and must be recorded in the minutes of the meeting. (c) the reasons why the part of the meeting is being closed, including (if the matter concerned is a matter other than a personnel matter concerning particular individuals, the personal hardship of a resident or ratepayer or a trade secret) an explanation of the way in which discussion of the matter in open meeting would be, on balance, contrary to the public interest. · if a member/s of the public wish to make representations, the Chairperson invites them to speak before the Committee makes its decision on whether to close the part of the meeting or not to the public. · if no member/s of the public wish to make representations the Chairperson can then put the motion to close the meeting to the public. The first action is for a motion to be moved and seconded based on the recommendation below. Over the past 30 years the Penrith area has evolved from its traditional rural roots to become a Regional City with a diverse, complex and involved community. 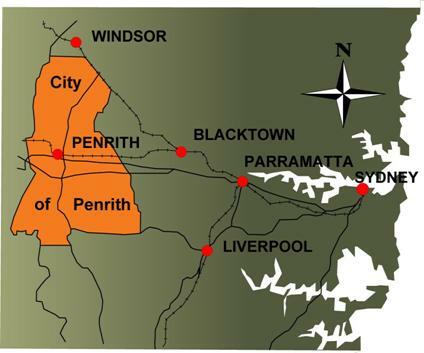 In 2005 the State Government named Penrith, along with Parramatta and Liverpool, as a Regional River City in its 25-year-planning framework, City of Cities - a Plan for Sydney’s Future. This was recognition of both Penrith’s traditional role in catering to a population catchment well beyond its geographic boundaries, as well as of the enormous potential the City has in meeting the future needs of Sydney’s biggest growth corridor. Penrith City will need to accommodate 25,000 new dwellings within the next 25 years and Council’s mission is to ensure this growth is accompanied by investment in infrastructure to ensure all the attributes that attract people to Penrith are protected or enhanced. Most importantly, it is Penrith’s unique qualities that are its strength. The City is distinguished by its natural setting, with its western edge defined by the flow of the Nepean River and the rising backdrop of the Blue Mountains. Historical rural landscapes and natural bushland areas characterise the City, and surround its urban neighbourhoods. Penrith has kept its identity and sense of place as it has grown and developed. As the City as a place has grown and matured, its community has also developed, diversified and become more complex. Today it is a large and vibrant community in a beautiful natural setting, with an egalitarian culture that embraces and encourages self reliance, responsibility and new ideas. The coming years, with well-managed growth, will see the City flourish as a creative, dynamic, diverse place – a magnetic place of first choice for residents and visitors alike in Sydney, able to compete on a national stage. In 2003, Penrith City Council adopted the United Nations Environment Program (UNEP) Principles for Sustainable Cities as Penrith’s Principles for a Sustainable City. These principles have been embraced by Council to help guide our journey towards becoming a sustainable city. The Principles form the basis of all our planning documents including this Strategic Plan, the 4 Year Delivery Program, annual Operational Plans and our Annual Report. Provide a long-term vision for cities based on sustainability; intergenerational, social, economic and political equity; and their individuality. Achieve long term economic and social security. Recognise the intrinsic value of Penrith’s biodiversity and natural ecosystems, and protect and restore them. Enable Penrith’s communities to minimise their ecological footprint. Build on the characteristics of ecosystems in the development and nurturing of healthy and sustainable Penrith. Recognise and build on the distinctive characteristics of Penrith, including their human and cultural values, history and natural systems. Empower people and foster participation. Expand and enable cooperative networks to work towards a common, sustainable future. Promote sustainable production and consumption, through appropriate use of environmentally sound technologies and effective demand management. Enable continuous improvement, based on accountability, transparency and good governance. As part of our sustainability journey, Council has undertaken a significant shift in our approach to planning and reporting. The Strategic Plan, 4 Year Delivery Program, 1 Year Operational Plan and Annual Report are now framed around Penrith’s Principles for a Sustainable City, cementing our commitment to a sustainable future and further linking Council’s key strategic documents. The diagram of the planning and reporting cycle provided below indicates how the Strategic Plan, Delivery Program, Operational Plan and Annual Report are linked, and the central role community and Council stakeholders have in contributing to our future directions. This Strategic Plan is Council’s principal policy document, guiding its leadership of the City. The plan provides a long term view for the City, stretching beyond the next ten years, and contains Council’s vision, and strategic directions for the future of our City. The 4 Year Delivery Program links the ‘planning’ in the long term Strategic Plan with the ‘implementing’ in the annual Operational Plan, setting out clearly the actions and activities Council will be undertaking in a four year program to deliver, or work towards achieving, Council’s longer term strategic directions. The Delivery Program is important in making sure that all of Council’s services and programs remain focussed on delivering the agreed long term outcomes for the City. Progress on our Delivery Program is reviewed and reported every six months. The Operational Plan is the ‘implementing’ part of Council’s key strategic documents, and outlines all of Council’s services. Most services will identify strategic tasks, to be undertaken in the year ahead, which will contribute towards the delivery of Council’s Strategic Program and Plan. The Management Plan also provides information on funding for each service, including specific tasks, and identifies the Managers and Directors responsible for the delivery of the service. Operational Plan performance is reviewed and reported on a quarterly basis. The Annual Report forms the ‘reflecting’ component of the cycle and reports our progress against our Strategic Plan, Delivery Program and Operational Plan objectives, outlining our key initiatives, and how we are performing, as well as challenges for the future. It provides a summary of performance on social, economic and environmental aspects of Council’s operations and activities through the use of a series of indicators, linked back to the objectives within the Strategic Plan. The Strategic Plan is the result of a collaborative effort, involving our Councillors, communities, businesses and Council staff. It addresses a broad range of issues which affect the City, and through a range of consultations encouraged the active participation of our staff and partners in setting directions that address those issues. § information available at local events and Council’s Open Day, and through Council’s website. § organisational sustainability – workforce, service delivery, capacity. § sense of place and identity - liveability, vibrancy, housing affordability and diversity. The Strategic Community Survey provided an understanding of how residents perceive Penrith as a place to live now in 2008, and how they see the City changing over the next two decades. To do this, the survey asked for feedback about Penrith’s existing services, facilities and lifestyle features, and gave residents an opportunity to voice their concerns and aspirations for the City. The survey included questions on home and environmental behaviour; Penrith City as a place to live; education; transport; perceptions of Penrith City; and participation in community life. In general, the feedback was positive. Residents were happy with the friendly atmosphere experienced within their neighbourhoods and felt that where they lived provided them with good access to educational services, shopping facilitates and other services. If those surveyed could make one immediate change to Penrith, 14.4% would improve the road system or reduce traffic, 7.4% would reduce crime, and 6.5% would increase parking. 16.8% hope that the City of Penrith will remain unchanged over the next 20 years, 9.8% want a city that isn’t crowded or overdeveloped, and 9.7% would like more open space and natural environment. Respondents feel that the major challenges that lie ahead for the city are providing the infrastructure to handle the increased population, providing adequate housing to meet demand, and improving public transport and roads. Council responses to the Strategic Survey, and the Workforce Forum, involved feedback from staff who live in the area, and those who commute from other areas to work. In general, the answers of the Strategic Staff Survey reflected the Strategic Community Survey responses. The Workforce Forum focussed on opportunities to improve Council as a workplace, including making things simpler, staff recruitment and retention, and staff communication and engagement. The issues, challenges, and responses identified through these many processes have informed the development of this draft 2009+ Strategic Plan. Feedback on the draft Strategic Plan and draft 4 Year Delivery Program is sought though a public exhibition that commences on 21 April through to 19 May 2009. Information about the documents and how to provide feedback will be on display at over 90 locations including the Civic Centre, Queen St Centre, all Libraries, all Post Offices in the City, the Visitor Information Centre, Youth Centres, Neighbourhood and Community Centres, Council’s Children’s Centres and Recreation Centres. Copies of the document in printed form and on CD-Rom can be obtained by the public from the Civic Centre and Queen Street Centre and all Libraries, as well as by request. Feedback through these avenues ensures that these plans have captured the essence of the engagement process, and that we are directing our focus and activities in the right areas. Engagement is an ongoing process, and we want to continue to communicate in an open and transparent manner and share knowledge. Developing a stakeholder engagement framework to take us through the delivery of the Strategic Plan will be an important next step. This Strategic Plan is Council’s principal policy document, guiding its leadership of the City beyond the next ten years. The plan identifies the priorities of the Council and the City’s communities, and outlines the long term strategies we will take to achieve these goals. The outcomes of our extensive research and consultation process helped to steer the direction of our Strategic Plan, and led to the development of a series of themes to guide the future of our City. The objectives state in clear and simple language what Council is trying to achieve under each of the key themes, with 2 or 3 objectives falling under each theme. Each objective has a series of strategic directions which provide clear instruction on what Council will be doing to achieve the objectives. The strategic directions have been divided into those that cover our role in the City, as well as those that relate specifically to Council as an organisation, and have a ten year timeframe for implementation. Penrith’s Regional City status brings significant opportunities and benefits for the community and Council. We will capitalise on every opportunity to enhance this status, driving Penrith to reach its tremendous potential as a Regional City in far more than just name. Council must be vigilant in identifying what our community needs and wants; and a spirited advocate in securing investment and amenities for Penrith. Many of the facilities and services needed for Penrith to reinforce its regional status must be provided by others agencies and organisations. Our recognition as a Regional City gives us the mandate to be heard and to demand support to take Penrith above and beyond our past successes. We won’t succeed in isolation and need to look beyond our local government area to attract investment and innovation, working together with governments, businesses and the community. In partnership, Council will lead the City’s advancement as a sustainable and prosperous city in an increasingly competitive climate. Council will provide strong leadership, combining experience and expertise with strategic planning and policy focussed ambition to continue to deliver the best possible City, harnessing the skills, commitment and pride of our community to bring the best to Penrith. We listen to our community, respecting the diversity that makes us strong. We are proud, both individually and collectively, and encourage these attributes through celebrating and promoting achievements and success. Penrith City will continue to grow while prudently balancing its social responsibilities, environmental impact and fostering economic potential in an exemplary way. We will continue to strive to provide leadership befitting our status as a regional city, respected by our community, peers and other levels of government. Change creates new challenges and presents new opportunities and our role as the leading advocate for the City demands that Council is well placed to not only capitalise on these opportunities, but create its own through intelligent partnering, planning and representation. Being identified as a growth centre comes with the opportunity to promote the benefits offered by our natural setting and world class facilities to a new audience. Growth, along with the associated facilities and services required by the complex community of a Regional City must be accompanied by significant investment and will increase opportunities for the residents of today as well as tomorrow, not simply meeting but exceeding basic needs. We will actively attract investment to the City while motivating and engaging the community to explore and develop further opportunities. Penrith will keep its identity and sense of place as it grows and develops in the global marketplace, confidently able to be considered a partner of strength. Our community will benefit from a range of housing, employment and lifestyle choices at all stages of life, balancing and respecting individual and common aspirations. As Penrith continues its journey beyond 2009 we will do so by fostering independence, tenacity and self reliance, while ensuring the attributes our community needs to thrive can be found or accessed within the Local Government Area. Our City’s composition of divergent natural, rural and urban elements are at the heart of why so many choose to live here. As home to much of the Sydney basin’s natural environment we have a moral and legal obligation to preserve and protect these elements from the harmful impacts of society as well as fostering awareness of its value and vulnerable status. We need to balance residential and industrial growth, achieving the social and economic benefits of growth without detriment to the environment. As a leader, it’s our duty to not only epitomise sound environmental practices and respect for our natural surroundings but to unite the broader community in this aspiration, educating and encouraging respect for social, economic and environmental harmony. We must also recognise past damage inflicted on the Nepean River and other aspects of our natural environment and work cohesively with our community and other resource managers to right those wrongs; improve the health of our habitat and inspire a custodial appreciation of our valuable natural setting. Today Penrith is home to a large and inclusive community which embraces and encourages self reliance, responsibility and new ideas. Our population is hard working, passionate, enterprising and generous. The City has already proven its adaptability, able to not only accept but thrive on change through several periods of rapid growth. Today’s population is made up of many long-term residents as well as first generation residents, united by a common goal to protect the attributes that attracted them initially and made them want to stay. We will work towards achieving a range of transport options that support comfortable and reliable movement throughout the City. As the voice of the community we must advocate at all levels to ensure quality access in and out of the City is maintained or improved. The use of our facilities will be encouraged by their easy access, appropriate to our diverse communities and of the highest standard. The health status of our communities will be enhanced as a range of choice is provided to support healthy lifestyles. Our residents will truly live in the City, not just reside here, with access to all they need within the City’s boundaries, including employment, education, health, government, recreational and retail services in a safe, rewarding setting. Penrith is home to an involved, fiercely passionate community enthusiastic about playing an active role in their future. Council will harness this drive thought a process of active engagement in the pursuit of our sustainable agenda. We’re open to new ideas and we embrace innovation, demanding and attracting the highest standards from those investing in the City. Interaction is encouraged, Council will pursue new opportunities with vigour and work to attract and nurture innovative practices and ideas to the City. Council can build a facility or provide a meeting place but it’s the community that will breathe life and energy into a venue. We will be recognised as a strong, progressive and energetic City.